I love an amazing candle. I love the way the right one can change your mood, alter an atmosphere or add a sense of warmth, comfort and calm to the room. And in the past few months I've spent a great deal of time on Google on the hunt for some that do all of the above but don't cost upwards of £45 for the privilege. And it's SO hard. And I realised it's also because it's impossible; you really can't get a great quality candle (i.e one that smells amazing/looks beautiful and lasts longer that a few days) without splashing some cash. 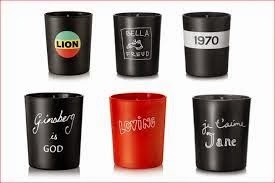 So, I'm going with it and saying you have GOT to buy one of these astoundingly beautiful Bella Freud Candles, £38. Or at least put one on your wish-list. Thanks to a recent birthday I have two of them but I'm on a mission (albeit a very slow one) to fill my house with them, simply because once lit, my je t'aime Jane candle transports me slap bang into the prettiest, flower-filled garden in Spring time. It's really that good. And also I once read that you should only fill your house with things you really love. And I absolutely love these.